Help us replant and protect our environment for everyone’s enjoyment! Join us for events during the month of April. Thanks to generous global efforts, the British Virgin Islands has made great strides in rebuilding after the devastation of Hurricanes Irma and Maria. There is an urgent need to replant the islands’ indigenous trees and vegetation to protect the entire ecosystem. We are asking for your support to make the Islands strong and green again. A generous donation of 3,000 fruit trees from our Caribbean neighbor St. Vincent and the Grenadines started the Seeds of Love process. We are now implementing an optimal planting plan and schedule; raising awareness and funds; organizing volunteers and voluntourists to assist in replanting; and involving local and global communities in these important efforts. With the help of the global community of friends of the British Virgin Islands, volunteers, voluntourists and members of our local community, we are taking action that will make the islands even more resilient to future storms while promoting sustainable tourism. When you donate, your contribution goes towards the purchase of seedlings and saplings. 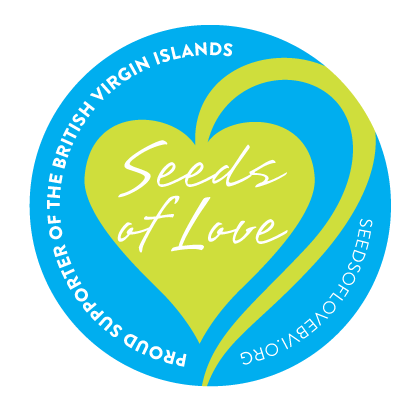 These will be planted by BVI residents, guests, and local organizations. you can track the progress on our Facebook page and our donation page. We’d like to partner and collaborate with you to create awareness and drive participation through sponsorships, special events and other promotional activities. Please contact us to discuss possible partnership opportunities. Volunteer and participate in our planting events and global Earth Day celebrations. Visit our events page for details on upcoming events and activities and how you can get involved. We are sincerely thankful for the support and contribution we’ve received. The response so far has been overwhelmingly positive! From our residents, to our local, regional and international industry partners. Your “Seed of Love” is not only a valuable contribution to our environment, but to our very existence. I am excited that this project is taking shape.